IMAX Deluxe Movie Virtual FX 3D Converter! & 14 DVDs!!! 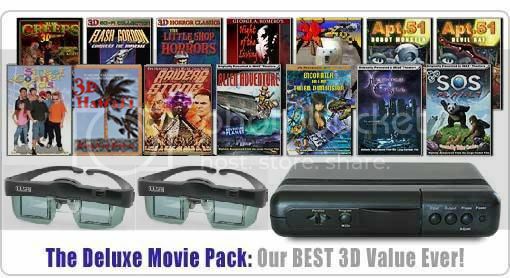 Home > 3D Glasses for 3D Projectors > 3D Theater For Any CRT Picture Tube Television > IMAX Deluxe Movie Virtual FX 3D Converter! & 14 DVDs!!! Get the absolute ultimate in the 3D movie experience, with our Deluxe 3D Movie Pack. Includes 14 GUARANTEED DVD titles (listed below including our new release The Creeps 4 IMAX DVDs), 2 high performance wireless glasses and the VFX 3D converter box. This advanced unit can also add 3D depth to any 2D video signal... from DVDs, Cable, Satellite and even video games! That's hours of mind-blowing 3D fun! Packages includes connection cable, power supply and instructions. 2 Pair of High Performance ELSA Wireless Glasses! The Virtual FX receives an ordinary video signal through a wire from your DVD, Video player, Cable box or Game console. It then sends the converted 3D Video signal through a wire to your TV set. The Converter System performs complicated mathematical algorithms which convert standard 2D video into Real 3D that can be viewed by watching your TV with the included 3D glasses. It does this by creating separate and distinct left eye and right eye images on your TV screen and displaying those images in an alternating format. The wireless 3D glasses included with this system operate by receiving an infrared signal transmitted from the converter box. The lenses of the glasses open and close in sync with the televised images ensuring that your left eye sees only the left eye image and vice versa, thus producing true stereographic 3D! Virtual FX is a plug and play unit. However, it does have several buttons that are used to enhance the 3D experience. The Input button is set for the type of signal coming into the converter (Game system, 2D Video or 3D Video). The Output button allows you to switch between seeing a 2D or 3D video image. The Phase Adjust button switches between left-eye-first or right-eye-first video viewing. The Parallax (<>) buttons are used to increase or decrease depth perception and the Program Mode button allows you to choose from 4 video source presets. If you have an HDTV Ready television picture tube style television just make sure that you can change the setting to 425i or 525i and it will work great!HDTV, Plasma, LCD, and many projection television systems refresh their image in a random manner making it so that many of these televisions are not compatible with 3D viewing systems. Basically some are compatible and most are not. International buyers the 3D viewing systems will not work with the newer televisions that are 100 HTZ. These systems do work with your regular televisions and are the exact same models as Razor 3D Europe carries.